STANDALONE novel. *A laugh out loud cozy mystery by New York Times Bestseller Addison Moore* This book can be enjoyed on its own without reading the other books in the series but for the full experience they are fun to read in order! My name is Lottie Lemon and I see dead people. Okay, so I rarely see dead people, mostly I see furry creatures of the dearly departed variety, aka dead pets, who have come back from the other side to warn me of their previous owners impending doom. Trust me when I say this is not a good sign. So, when I spot an adorable, fuzzy, little squirrel skipping around at the grand opening for my new bakery, I about lose it, until I realize it’s a perky little poltergeist only visible to yours truly. But there are so many people at the grand opening it’s hard to discern who exactly might be in danger—that is, until I follow the little creature right out the back and straight into another homicide. It’s horrible to see your friend lying there vacant of life. Honey Hollow will never be the same. From the NEW YORK TIMES and USA TODAY bestselling author, Addison Moore—Cosmopolitan Magazine calls Addison's books, "...easy, frothy fun!" 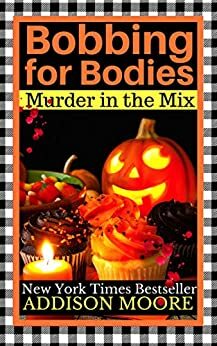 The entertaining intrigue begun in the first Murder in the Mix story continues as Lottie Lemon once again becomes entangled in a murder. This time the homicide hits her harder, and though she personally knows how asking questions can be dangerous, it is not going to keep her from snooping for facts relevant to the case. Addison Moore sprinkles in a clue from time to time, which caused my guesses about motives and the identity of the killer to continuously change. There is also a romance that has to overcome plenty of challenges before the relationship can move forward, and how every situation played out between the characters kept me thoroughly captivated. When Lottie Lemon came upon a body the month before, she had known something was going to happen to the woman because of having seen a ghost cat next to her. What made the incident even more unusual is that when she spies a deceased animal near its former owner, the person will soon have a bad experience. Lottie hopes the prediction of death never occurs again, but the very first day her new bakery is open, the spirit of a squirrel appears. Wanting to know to whom the critter once belonged, she follows it, and sadly finds the body of someone known to her. There is a perfect balance of romance and mystery in BOBBING FOR BODIES. What caused the death of a Honey Hollow resident may be known, but none of the other questions related to the murder have a clear-cut answer. I was drawn into the many ways that Lottie was seeking to uncover any relevant information, and several of the situations in which she finds herself are very comical. There are also moments where suspense builds, and I fretted over how things would end. The relationship of Lottie and two very different men is certainly interesting, and reactions of the three are honest and sometimes fueled by intense emotions. I really enjoyed all the events connected to Halloween in the story, as the season comes alive with tasty treats and fun activities. 4.0 out of 5 starsA Halloween mystery with a dead Squirrel twist. Lottie finds herself enjoying the opening of her new bakery when the ghost of a squirrel leads her to discover another dead body. Lottie is then left to try and figure out who killed her friend and why. The book takes you through the process of Lottie trying to solve a murder, find out how Noah feels about her and her budding friendship with Everett. The story was interesting and kept me entertained throughout. The Halloween setting was perfect for this time of year. Looking forward to the next book in this series. 5.0 out of 5 starsLoving Lottie! Trouble or seeing dead pets keeps Lottie's life interesting. Lottie's new bakery and trying to solve murders is keeping her busy. Loving this series! I am definitely hooked! I like these stories, what I don't like is that you get hooked on them and then each one gets more expensive until you can't afford to buy them.